A few days after my White Tara initiation, Romio called and said one of the more wealthy and famous White Taras wanted to put money in a fund. At that time there was no fund, yet it planted the seed for one to sprout. I saw the passing of money in a way that truly acknowledged our oneness as the 1000 White Taras. 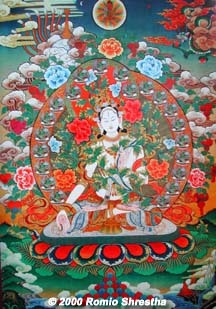 If a White Tara needed money, it would flow to her. A Tara would announce her need and as soon as a Tara that had an abundance in that area heard the need... it would be met. Since that time I met with a White Tara who is a lawyer (for a well known Guru and White Tara) and talked about an easy and legal way to set up the fund. She said it could be set up in a way no person needed to manage it, control it or be responsible for it... it would belong to all the Taras. I also see people other than the 1000 Taras who would like to support White Tara, be able to put money into the fund or directly to an individual White Tara's work. Like Ram Dass said of his relationship with his Guru... When I AM... I am you... when I'm not... I serve you. There are many serving the dream of compassion and there are many inspiring works being done.